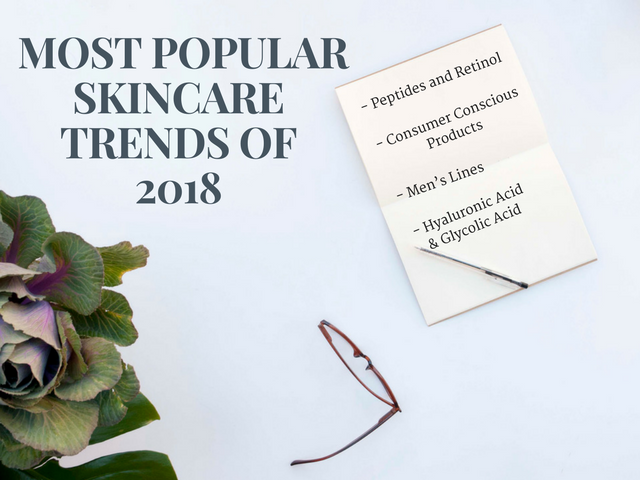 The year 2018 is upon us, as are some fun and exciting trends in skincare! If you have not yet started using products that have hyaluronic acid or tried men-specific skincare lines, keep reading to learn more about trending methodologies and products that might just transform your skincare routine. The 2018 consumer is seeking products from companies that go far beyond those using environmentally friendly and sustainable ingredients and packaging or cruelty free testing . You are going to see more and more products that feature gluten free and vegan skincare items. This shift is directly driven by changing consumer preferences, as well as companies that give back a percentage of sales to local communities and charities. The consumer-conscious skincare movement continues to evolve this year. More natural ingredients will continue to be incorporated at a higher level this year. Hyaluronic acid is a component found in all of your skin cells. It helps to retain moisture, prevent or slow the aging process, and used in products to promote a collagen-boosting effect . Many skincare companies are using this ingredient to boost the natural levels of hyaluronic acid already in your body to fight aging. You will also see a significant increase of glycolic acid which is derived from sugarcane. This trending ingredient is considered one of the most powerful of all the alpha hydroxy acids and it is even used in skin peels administered by medical professionals. It has the ability to thicken skin, regenerate collagen, and even out skin tone. According to Allied Market Research, the global men’s personal care market is expected to reach $166 million by 2022. In 2015, the US market was worth $36 billion. This year, you will continue to see more blue and grey bottles and packaging on the shelves catering specifically to men and their skincare needs and preferences. In fact, the men’s magazine GQ even has an annual grooming awards list to showcase the best products available for men and their skincare and grooming routines. Peptides and retinol are also ingredients that are highly effective in the anti-aging process and growing in demand by all skincare consumers. Retinol is a derivative of vitamin A. Individuals who use products featuring these ingredients include wrinkle and fine line reduction, minimized acne and facial redness, as well as an overall dewy glow that replicates the results of a facial. These 2018 trends of more effective and natural ingredients, more products for men, and consumer-conscious movements are just the beginning. At the end of the day, these trends are going to make more powerful products without having to go to the doctor to look younger.